We strongly recommend wearing gloves and using nuclease-free tubes and reagents to avoid RNase contamination. Reactions are typically 20 μl but can be scaled up as needed. Reactions should be assembled in nuclease-free microfuge tubes or PCR strip tubes. The kit is capable of synthesizing biotin- or dye-modified RNA with the following protocol. The recommended molar ratio of modified NTP (Biotin-, Fluorescein-, Digoxigenin-, or Aminoallyl-NTP) to standard NTP is 1:2. The following reaction set-up assumes modified UTP is used. Please note that Dye- or Biotin-NTPs are not supplied with the kit. Thaw the necessary kit components, mix and pulse-spin in microfuge to collect solutions to the bottoms of tubes. Mix thoroughly, pulse-spin and incubate at 37°C for 2 hours. For short (< 300 nt) transcripts incubate at 37°C for 4–16 hours. Note that the ratio of modified nucleotide to standard nucleotide can be adjusted by varying the amount of the NTP Buffer Mix and modified nucleotide. For complete modified nucleotide substitution we recommended using the T7 High Yield RNA Synthesis Kit (NEB #E2040), in which the four nucleotides are supplied separately. 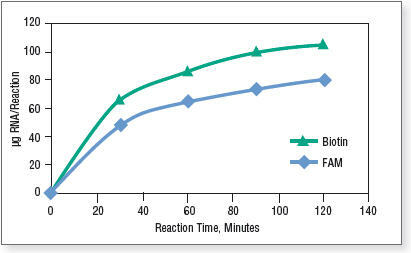 Figure 1 shows the time course of labeled RNA synthesis using 1 µg control template with Biotin-16-UTP and Fluorescein-12-UTP following the above reaction setup. Modified ribonucleotides reduce transcription efficiency; therefore, lower transcription yields should be expected as compared to transcription using unmodified NTPs. In general, Biotin-NTP and Aminoallyl-NTP have an insignificant effect on yields, while lower yields can be expected for transcription reactions containing Fluorescein-NTP or Cy-NTP. In addition, transcripts containing modified ribonucleotides have reduced electrophoretic mobility due to higher molecular weight. Reactions were incubated at 37°C in a thermocycler. Transcripts were purified by spin columns and quantified on a NanoDrop Spectrophotometer. Optional: To remove template DNA, add 30 μl nuclease-free water and 2 μl of DNase I (RNase-free), mix and incubate at 37°C for 15 minutes. Proceed with purification of synthesized RNA or analysis of transcription products by gel electrophoresis.